Designing a space for your child can be fun. If your child is old enough, he or she can have some say in how it is decorated, color choices used and the like. You as the adult can provide guidance and, of course, have the final say. When designing a shared kids space, it can be a little more, well, challenging. You have the same parameters as with a single kids space, but the needs are multiplied. Here are some suggestions on how to tackle those challenges and create a place your children will love! Whether you are planning for one child or two or more, they are growing and their needs changing. When designing a shared kids space, you have to keep that in mind. The space, at its core, should be simple enough to be flexible so that it grows with your child. If you choose a simple color palette, you can add or change decorative elements as your child grows and changes. You could even select gender-neutral colors for a space that will serve children of more than one gender. Choosing classic pieces of furniture helps create flexible and long-term use. For example, an upholstered mid-century rocker works great for nursing your baby, and as your child gets older, it can also be an inviting place to read. The same might go for the dresser and “big kid” bed. Whatever you need in regards to storage for one child, you need that multiplied for more, but it doesn’t have to be overwhelming. Classic woven baskets and shelves are great because they fit in well with a wide range of design schemes. Putting hooks, for jackets or bathrobes, at different heights makes them accessible to each child and give them a “spot.” Being able to hide storage away, such as in a cabinet or under a bed, can prevent the space from feeling too cluttered. When designing a shared kids space, you should think not only of shared storage but the needs of the children as individuals as well. You might designate a closet space for each child. For example, child A may have the right side of the closet which is painted green. Child B may have the left side which is painted blue. Each child may also have designated shelves and hangers. They may even have personal storage beneath each of their beds. Rooms stay more manageable and enjoyable when everything has a home. Art is an essential part of childhood. Your children will need not only a space such as a desk or workstation to create art, but they will also need a place to display their art. There are so many fun possibilities for displaying their art; your imagination is the only thing that hampers you. Put bulldog clips on a painted board and hang it on the wall. They can hang their artwork using the clips. Not sure about putting something as structural and heavy as a board on the wall? Many people attach strings around the room like garland and clip the artwork to that. You can make a bulletin board or even use magnets to hang artwork on a whiteboard. If you want to be bold paint a door or even a whole wall with chalkboard paint, give the kids some colored chalks and let them go to town! Dr. Seuss says, “The more that you read, the more things you will know. The more you learn, the more places you’ll go.” To encourage reading, give your kids an inviting space for doing just that. 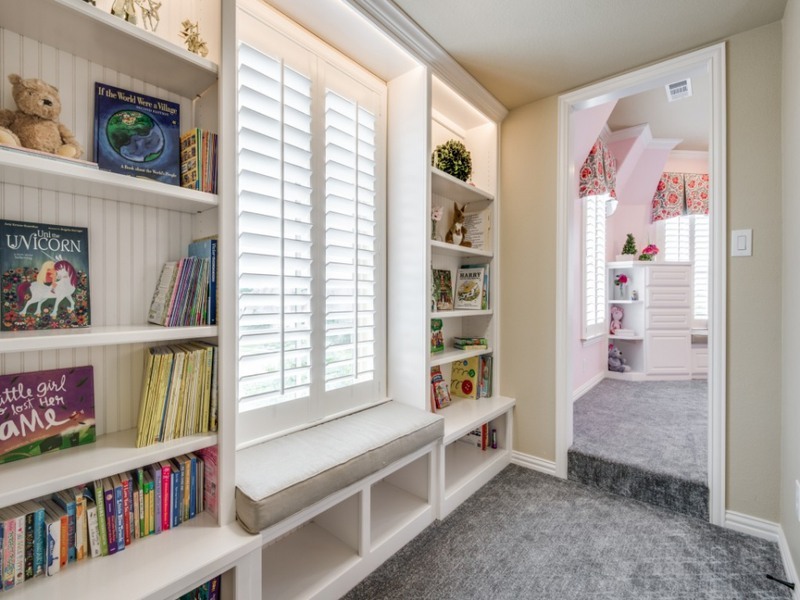 When designing a shared kids space, a reading nook is something that serves everyone. Prepare a quiet corner or loft with shelving nearby for keeping books. Make sure the area is comfortable with pillows and a rug or blankets and good lighting – place a comfy chair next to a window or lamp with a bookshelf nearby or even some floor space with beanbags and pillows. To see more photos from this dreamy girl’s bedroom, click here. Personal touches go a long way especially when designing a shared room. Make their individual space feel special with bedding that the child chooses individually, maybe a shelf for trophies and knick-knacks, or even some sort of wall decoration next to the child’s bed. When designing a shared kids space, you’ll find many of the same fun challenges as creating a space for a single child. Let your imagination run wild! Consider things such as colors, flexible furniture, storage, artwork, reading nooks and decoration. Most of all, have fun! Creating a space for your kids that is both fun and functional doesn't have to be work. Collaborate with our designers to make your kids a dreamy space (and parent approved).